I thought I'd share another of my daughter's favorite books with you. 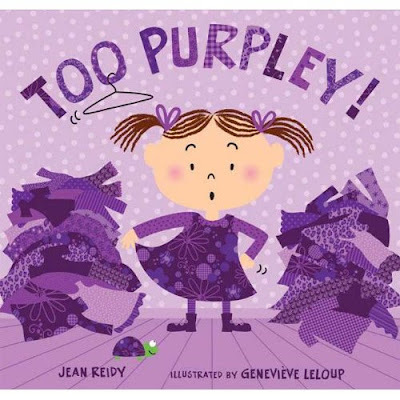 This one is "Too Purpley" by Jean Reidy. She's a children's author and she does a great job of making the book simple and fun for the kiddies. If you have a little budding fashionista like I do, then she will definitely relate to this book. It's about a little girl who finds something wrong with everything she puts on.."too purpley..too polka dotty" etc until she finds the perfect outfit for her. The illustrations are really cute and really help depict the story so my daughter actually "reads" it to me instead! 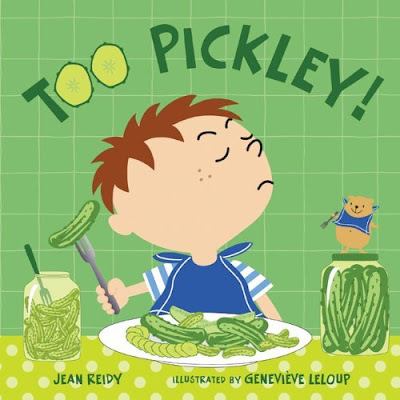 "Too Pickley" is Jean Reidy's newest book and it's set to be released in July 2010. It's about a little boy who is a picky eater...we can all relate to that, right? "Too wrinkly, too squishy, too fruity, too fishy! Reidy's playful rhyming text is once again brought to life by Leloup's stylish bold art. Parents (and children) will love the hilarious antics the boy goes through, and the reassuring joy at the end of all that kitchen-table drama." Hi there i am your newest follower and my daughter is obsessed with those books as well. she didn't get her nickname "sassy," by being laid back! !